My older one is a super fan of Schezwan sauce. So to accommodate her taste buds, I made this sandwich. She loves Tofu and Schezwan sauce and so the combination cannot go wrong. Since it was a spicy sandwich my little one was happy to enjoy her Carrot Lemon Sevai. It is a very quick and no-nonsense sandwich. The only time taken is to marinate the tofu and then grill it. I usually marinate it overnight thus reducing the active time required to make this in the morning rush hour. Marinate the tofu slices in schezwan sauce and sprinkle salt to taste. Set aside for 15 minutes. Meanwhile apply schezwan sauce to the bread slices and set aside. Grill the Tofu slices until the grill marks are visible. Arrange them on one bread slice, cover it with the other bread slice and grill until done. Remove and serve for a spicy treat. Tofu sandiwicha? Edu super idea va eruke... with that schezwan sauce I am sure this is will be a huge hit. Incredible and i never tried tofu in sandwich. Now you gave us to dish out an another fabulous dish to prepare with tofu. Thank u Harini. Tofu sandwich sounds interesting, with that schezwan sauce , it must be delicious. Great idea, will give a try !! Tofu and schezwan sound like a terrific combo ! Haven’t tried a toast with it but yes I love the idea of this sandwich , schezwan is such a delicious flavour to indulge in . That is an awesome sandwich with tofu and schezwan sauce. This would make a great snack after school also..
Wow what a lovely variation to grilled cheese sandwich Harini. Schezwan sauce with tofu must have so much flavor and spiciness to the sandwich. This is a good one Harini. Tofu will be mild and with that spicy schezwan sauce it will be definitely be a super combo!! A different kind of sandwich with schezwan sauce and tofu. I'm sure it must have been lip smacking good. 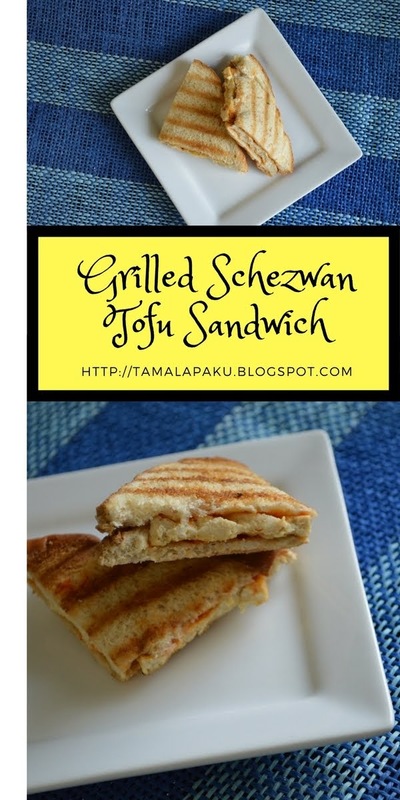 Good variation to the grilled cheese sandwich and this tTofu and schezwan sandwich sounds flavorful. There is nothing like dishing out what the kids love and seeing them enjoying it..very good recipe! Spicy treat! Yumm i love schezwan sauce, I bet the sandwich is a wining combo! wow such an interesting and easy to make a sandwich with tofu, The sandwich is grilled so perfectly !!.. Very tempting recipe.. I have not tried tofu in sandwich yet, but I am thinking this would taste just like paneer. This would be a great quick lunch idea. Love it! Grilled tofu sandwich sounds like a nice idea. I am sure my indo-chinese lover girls would love it. My kids too love the schezwan flavor. Never occurred to me to try it out with bread!Superb idea Harini.